Mitch Shipman, owner and founder of Blue Beetle, was born and raised in Kansas City. Mitch graduated from Rockhurst University in 2000 with a business degree and a passion for entrepreneurship. 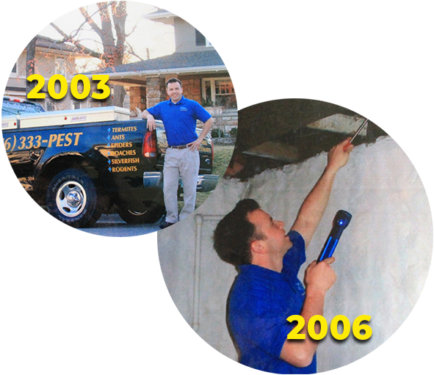 With prior pest control experience he started Blue Beetle in 2003 from the ground up with one truck and a credit card with a $1,000 limit. When he wasn’t servicing homes and businesses, he spent his days door-knocking to spread the word about his new company, and his nights developing the brand, working on the website, and coming up with new ideas. 2006 was Mitch’s last year on his own. After three years of growing and developing his business, he was ready to start adding to his team. He ran his business from his home and kept supplies in a shed in his backyard. His dedicated employees are what helped shaped Blue Beetle into what it is today. John Bauer, one of his first technicians, is still employed to this day! demanding of circumstances separates us from our competitors. Blue Beetle is a company with a proud history and a promising future. We stand on a foundation of training, growth, and improvement. Each day we make significant investments in our people, management, and our services to ensure your property is being treated with the best care and products. Our goal is to better serve our customers, team members, business partners, and community. We are a company that prides ourselves in our culture and our dedication to keeping our clients happy. 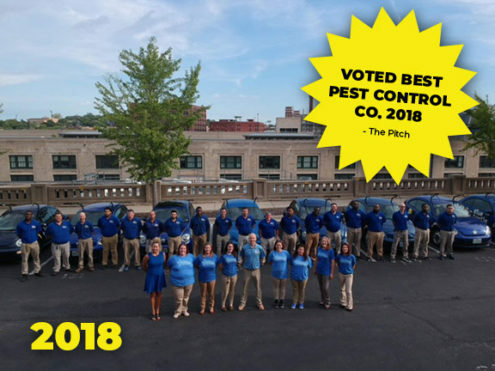 Our technicians/heroes have the experience and knowledge needed to successfully address any pest challenges you might be dealing with. They take the time needed to assess your problem, offer a range of solutions and provide you with the information you need to make a sound decision for your family, your lifestyle and your budget. we're killing it here at blue beetle!